Yesterday was one of my proudest days since moving to India. As I’ve written about before, I recently went back to the US for family reasons. It was jarring. To go from a place where poverty is in your face and most people around you have very little, into the crisp clean wealthy world of American life was fairly overwhelming. And it made me really look at what we own in a different light. While I was sitting at home in Charleston, I was especially drawn to all the books that were sitting unused on our bookshelves. I couldn’t help but think of all the time I’ve been spending in Dharavi. Wouldn’t just one of these books be an inspiration for a child who has so little to call their own? Didn’t we all as children read the same book over and over again anyway? (I certainly read Goodnight Moon more times than I can count). So the thought marinated for a bit. Why couldn’t we somehow get these unused books to people here in India? 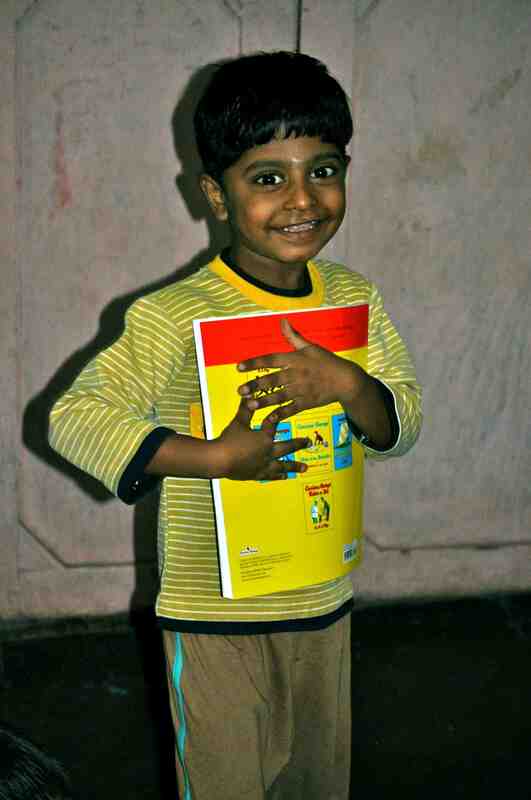 Children with their new books! From that initial germ of a thought came the concept for Book of My Own, a project a few friends and I have started to encourage expats and travelers to bring old books from the US for kids in need here. We believe that book ownership is empowering – by having a book that is theirs these children can remain inspired even when school lets out for the day. The idea has spread more quickly than we imagined. Within a few weeks we already had two travelers bring books. And yesterday, we really got started. 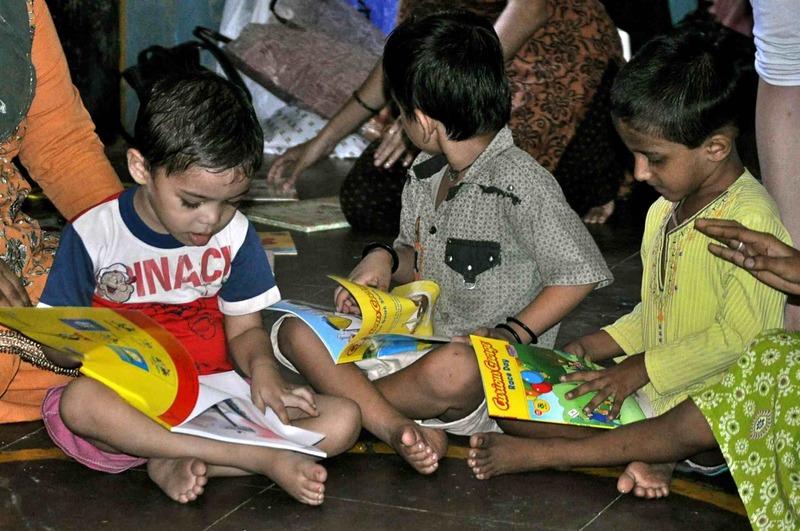 We gave out books to 30 students in a kindergarten classroom in Dharavi. It was amazing to watch the kids’ faces as they picked out the book that they wanted to keep. Some of them clutched to their books once they got one. Others immediately plopped down and started reading and pointing pictures out to their friends. 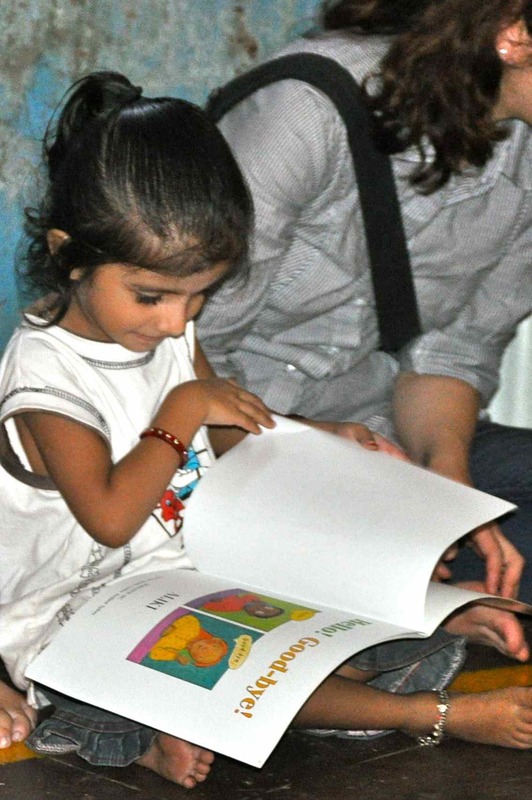 When we had story time their enthusiasm was even clearer – every page was a question. Why is that lion there? What is happening next? Why does that tree look like that? Will it all turn out ok in the end? These are kids that are engaged, excited and ready to learn, in spite of all the difficulties that surround them in their daily life. They only spend four hours in their classroom each day. Now they get to keep learning and thinking at home. I hadn’t written about this before because I didn’t want to get my hopes up that the kids would care about it as much as I thought they would. I didn’t want to seem self-congratulatory when we hadn’t really done anything. But I’m going to go out on a limb now and say I think we really did make a small change in each of those 30 kids lives. Maybe it’ll be nothing; maybe the excitement will have vanished by today. But I get the sense that those books are going to get well worn from being read over and over again, just like my copies of Where the Wild Things Are or Eloise eventually did. And in a place like Dharavi where the small things count, I’m suspecting this will have a large impact. We’re just getting started. I’m hoping that within a few months 30 kids will become 300 kids. But no matter what, yesterday was a great day.